Obviously, the world is changing. Today, success calls for seeing technology as the greatest opportunity – yet technology without design is encryption without a key. The function of legal service is to enable businesses and society to grow, solve problems and function in the best way possible. Technology and design have changed the world: their impact on business and society have been radical and now that impact is catching up with legal services as well. Legal design utilizes the newest tech innovations (e.g. artificial intelligence and blockchain) and design to make legal services as efficient as possible and to enable legal services to serve their clients in the best way possible. The renaissance wasn’t just something that happened to other people. 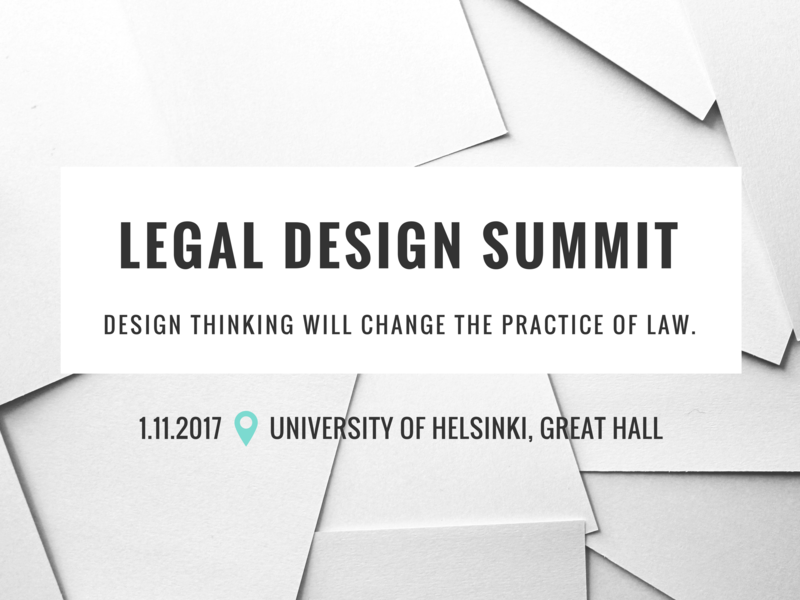 Design thinking will change the practice of law on the 1st of November. Welcome to the largest legal design event in the world. Case: Mutual Pension Insurance Company Varma – Redesigning insurance decisions. In-House Panel: REALITY CHECK: GDPR is coming (to get us? ): TBA soon!